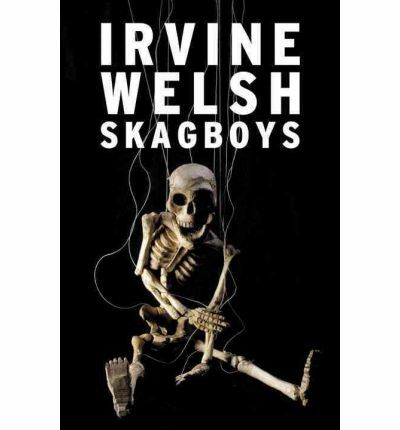 Skagboys is the latest offering from Irvine Welsh, who burst onto the literary scene with the notorious Trainspotting (1993). Skagboys revisits the characters of Trainspotting, trailing them on a manic journey into the Edinburgh’s drug scene. Welsh describes it as a “why” book, investigating the characters, relationships and the broader society that the characters inhabit. It is an erratic and difficult novel, but it has been met with considerable praise since its publication in 2012. Like Trainspotting, Skagboys is written in a strong Scottish dialect. There is no glossary. There’s no central point of view. There’s no discernible plot, beyond a sprawling attempt to explain how the main characters of Trainspotting (namely Mark Renton and Sick Boy) came to be heroin addicts in the Scotland of Maggie Thatcher. In an interview, Welsh said of the social setting that drove the young men to dabble in drugs ‘when there’s no employment and education and opportunities, it’s almost like drugs win by default. There is, literally, nothing else.’ This is by no means a book one takes on lightly. The confusing form the novel takes obviously echoes the disjointed and jarring world of the young men that fill it. Chapters jump perspectives without signposting whose story we’re experiencing. One gets the sense from this lack of narrative clarity, that while it is their story of drug addiction, it broadly speaks of a generation that lost themselves. Welsh made it clear that Skagboys grew from original Trainspotting material, and it does at times feel like a work born from many small parts, rather than a cohesive story. It is certainly a novel for Welsh’s fanboys/girls, closed off from the uninitiated. Skagboys is published by Jonathan Cape, London, an imprint of Random House. I just read your website review of Skagboys by Irvine Welsh, who is one of my favorite authors. Edinburgh who is just trying to establish myself right now. I have one book published so far, while my other books are all self published. I’ve written a new book, a kind of dark, edgy, black comedy satire, set in an Edinburgh Cafe during next years referendum in Scotland. Where a lot of weird, wonderful and quirky characters come and go throughout the day, sharing stories from their crazy screwed up lives. While some just want to voice their radical opinions on Scottish Independence. The book was released on December 17th and I was wondering if you would have time in your busy schedule to review or spotlight the novel at some point over the next few months. It’s a 50/50 with the Scots/English dialect. So I think it might appeal more to fans of Irvine Welsh and other Scottish authors who use Scots dialect in their writing. Right now I’m just trying to find a select target audience for my work and get it out there. Here is a brief Synopsis. It’s also new ‘Pro UK Union’ chef, Richard’s, first day uv work at the Edinburgh auld town cafe. Where tae his great displeasure, he’s already been left oan his tod tae run the evening back shift by his sexist, womanising boss Brian, wi only the pretty and fiery, Pro ‘Scottish independence’ student waitress Toni, tae assist. Throughoot the shift Toni and Richard are visited by many weird, wacky and wonderfully humorous customers. Some uv whaim are jist in fur a wee banterous blether, sharing their radical political opinions wi any bampot whae’ll listen a damn, efter voting on Scotland’s historical day. Independence malarkey and jist want tae huv a quiet bite while sharing their ain crazy, freaky stories from their screwed up lives. discussing a new Scotland efter Independence. Including the rebuilding of Hadrian’s wall, strict border controls and new anti English road layouts. Wi aw new Gaelic road signs tae make it even harder and more frustratingly annoying fur any English tourist tae find their way aboot. Arguments and opinions begin tae get more and more heated and radical the closer the referendum results are tae being announced. So if ye enjoy yur average run uv the mill stories like ye enjoy a nice wee safe cup uv coffee likes, wi Milk and jist the wan sugar ken. Noo is the time tae take it completely bitter black… wi jist a wee pinch uv salt fur gid measure, ken whit ah mean. chapters, then I can send you a copy in any file format you desire. you again soon, even if just to say no thanks. If you’d like Lip to review your novel, the best thing would be to email our Literature and Books Editor, Jess Alice with more details – her email is books@lipmag.com. This entry was posted in Arts, Books and tagged book review, books, drugs, fiction, heroin, Irvine Welsh, literature, Review, Skagboys, society, teen, trainspotting. Bookmark the permalink.